You may remember that we love pizza. There are quite a few recipes on here for pizza considering how this blog is young (but it’s growing up fast-it will be a year old in September!) and we don’t have a lot of recipes overall compared to older veteran blogs. This tart is pizza in, well, tart form. And it is so good! You start off with a basil and garlic crust, which is spectacular, buttery, and full of flavor. We opted against using fresh mozzarella, since we wanted to avoid the possibility of a watery filling. 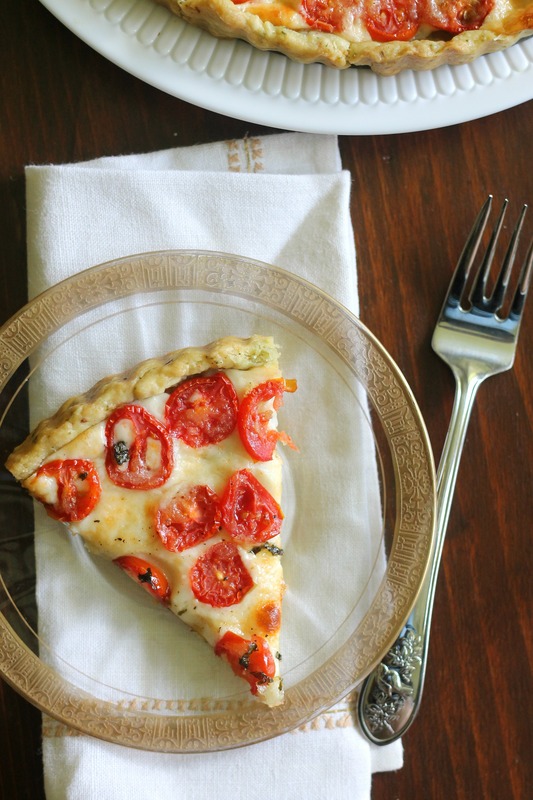 Since tomatoes are in season now, the cherry tomatoes on this tart were really good! A nice finishing touch was some basil and fresh Parmesan sprinkled on top before it baked. It was a spectacular lunch- we would make it all the time if the crust wasn’t so full of butter and could limit ourselves to one piece. 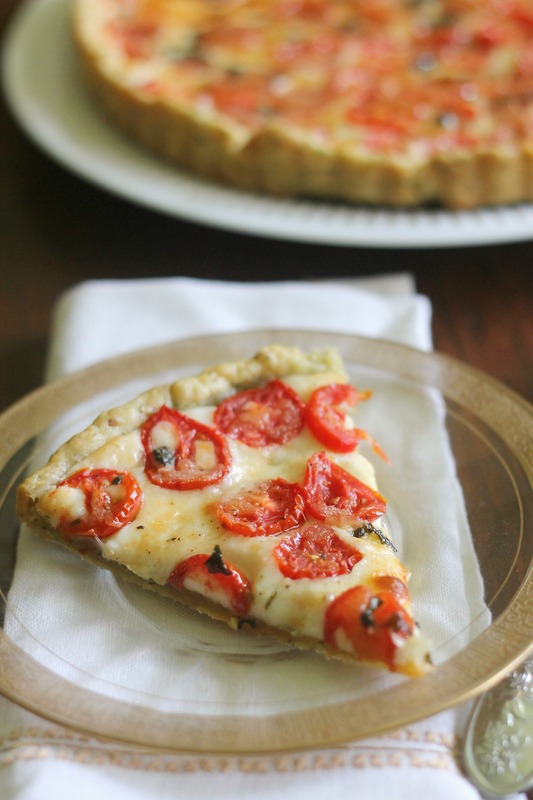 So, next time you are craving pizza, give this tart a try! It is just as easy (if not easier) than homemade pizza. Place the basil and garlic in the bowl of a food processor. Process briefly, scraping down the sides of the bowl as needed, until finely and evenly minced. Add the flour and salt. Pulse briefly to combine. Add in the chunks of butter and pulse about 10-11 times, or until the mixture resembles pea-sized crumbs. Add 4 tablespoons (1/4 cup) of the water and pulse a few times to incorporate. If the dough does not form a ball, add the remaining tablespoon of water. Remove the dough from the food processor, flatten into a 5-inch disc, and wrap in plastic wrap. Refrigerate for at least 1 hour. Preheat the oven to 425° F. Transfer the chilled dough to a lightly floured work surface (or a lightly floured piece of parchment paper to make cleanup and transfer easier) and roll out into a 12-inch circle. Lay the dough over a 9 or 10-inch round tart pan and press it into the sides. Trim the excess dough if necessary (we just pressed excess dough in thinner areas). Lay a piece of aluminum foil or parchment paper loosely over the tart dough and fill the center with baking beads, dried beans, rice, etc. Bake in the preheated oven for5- 10 minutes. Remove from the oven and carefully remove the foil or parchment and baking beads. Return the empty tart shell to the oven to bake for 3-5 minutes more. Remove from the oven and lower the heat to 375° F.
Cover the bottom of the baked tart shell (it’s fine if it is still warm) with the sliced mozzarella. Arrange the cherry tomato slices on top of the cheese in a single even layer. Season with salt and pepper. Drizzle with olive oil. Top with freshly grated Parmesan and minced fresh basil. Bake about 30 minutes, or until the crust is golden brown and the cheese is bubbly and lightly browned. Allow the tart to rest for about 5 minutes, slice, and serve. Enjoy!